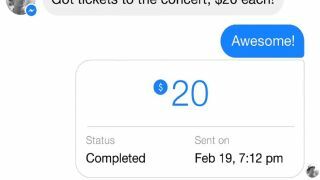 Update June 30: Just over a month after launching in NYC, Facebook Messenger payments are now available to everyone living in the US. No word yet on a global roll-out. Users can complete person-to-payment payments within Messenger just by adding their debit card information. Any funds you send will go directly into the recipient's checking account. Facebook promises it's secure, so if you're tired of always owing your pals money, Facebook Messenger payments may be for you. When the payment option launched in the Big Apple, it brought along a few improvements, including hyperlinked dollar amounts that, when tapped, will automatically start a payment (senders can confirm the payment before it's passed along). Users can also pay individual friends from within a group chat, and people in the multi-person convo can see who has send money and for what amount. Facebook has launched a new feature for its Messenger app that lets you send money directly to your friends. It's rolling out "over the coming months" in the US and then may (or may not) extend elsewhere. Simple, quick mobile payments are being built into a whole host of apps and services: Snapchat introduced a similar scheme in the US last November and the feature arrived in Gmail for UK users in January. That's on top of established services such as PayPal and new ones like Apple Pay. If you owe your pals a bit of cash then there is now a plethora of different ways to pay them back, with more arriving all the time. The mass appeal of Facebook Messenger makes this one of the more high-profile options, however. The first time users try to make a payment they'll need to link a valid debit card and set up a PIN. Facebook is promising "layers of software and hardware protection that meet the highest industry standards" in the official announcement. If you're running Messenger on iOS then you can use Touch ID to verify your identity. The social network already has plenty of experience handling payments of course, from advertisers selling their wares and gamers looking to get to the next level of Bubble Witch, so the launch should be a fairly smooth one.